I have got a mini computer with 32Gb of internal storage. Windows 10 takes at least 20Gb and the disk is now full. So I decided to move the system to an external HDD SSD drive, using minitool partition wizard. disk 1 is the internal disk. 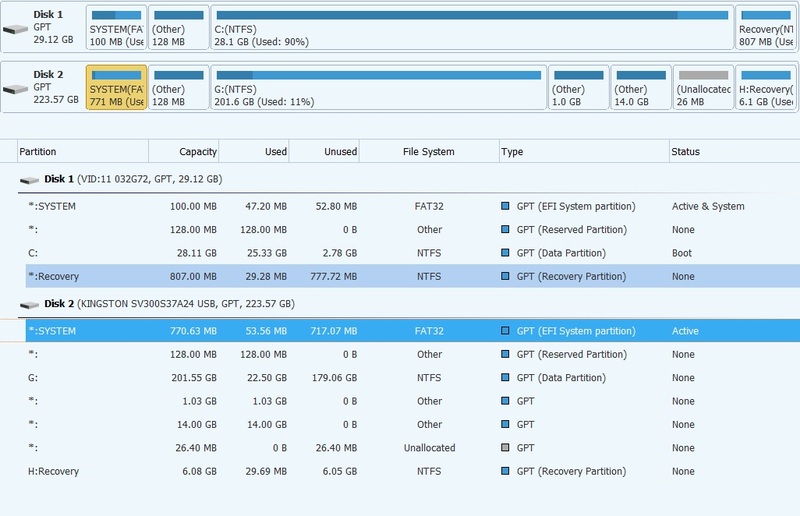 You can see 2 EFI partitions in the 2 disks(I don't know if it is important but maybe there should be only one). but then I have an arror after "bootrec /RebuildBcd" : if lists one disk, I get a question ("add installation to boot list? "), and then I get the error "the system cannot find the file specified". if not, is the problem linked to two EFI? if so, can I remove one? Browse other questions tagged windows-10 boot partitioning repair or ask your own question. Bootrec freezes - Do I need to reinstall?